The first community forum on the planned installation of the police surveillance cameras has been set for Wednesday, December 9th. The forum is being sponsored by the OB Citizens Against Privacy Abuse (CAPA) and will be held at the OB Recreation Center. The forum will run from 6:30 to 8:30 pm and will include a presentation or two by members of CAPA as well as a question and answer session with San Diego Police representatives. Councilwoman Lorie Zapf has been invited to address the forum, as well, as it was her office that found funds for the surveillance cameras. The OB Rec Center is located at 4726 Santa Monica Avenue and the forum will be held in the Community Room. This is the first of several forums being planned by OB CAPA. One of the chief complaints by members of CAPA about the cameras was the total lack of community discussion or debate before it was announced the cameras were going up. this kind of stuff USE to be common knowledge…. guess FEAR still trumps SANITY, for many. All OBceans are invited to come out tonight – Wed, Dec 9th – for the first in a series of public forums on the police cameras – 6:30 pm at the OB Rec Center. The San Diego Police Department Western Division has decided that we will not be in attendance at tonight’s OBCAPA forum. We understand that OBCAPA was formed to provide an opposition voice from some in the community to the installation of the Ocean Beach Public Safety Cameras, and respect your opinion. Since July we have attended quite a number of community meetings to include, the OBTC, OB Crime Prevention Meeting, OB Planning Board, the North Bay Planning Board (Sports Arena & Midway area) and the Sunset Cliff Natural Park Council Meeting. We have walked along the seawall and the areas of Saratoga park and had personal conversations with community members over the cameras. We have sent out email to the community with links to news articles covering the cameras and posted those links to our nextdoor.com account. To date, the only opposition we have heard from the community has come from the OBCAPA and the OBRAG. 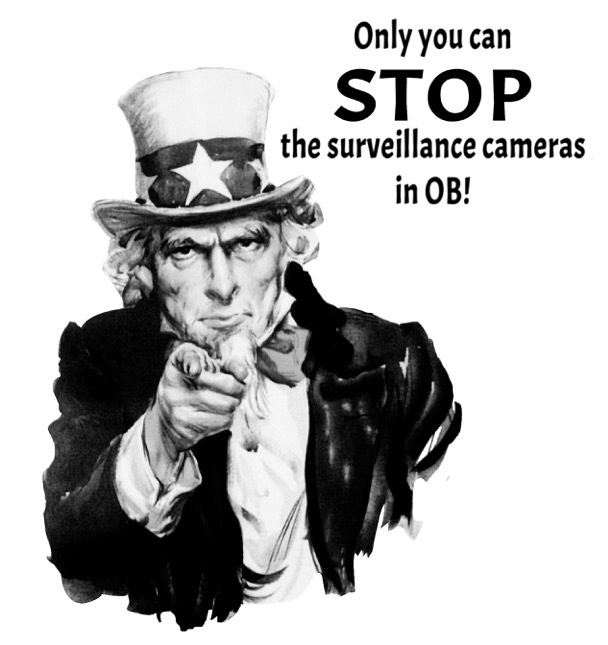 The OBRAG has posted numerous opposition articles re: the cameras and even held two online non-scientific polls. The most recent poll showed in excess of 67% in favor of the cameras (http://obrag.org/?p=101469) . The San Diego Police Department believes that we have been more than reasonable about listening to concerns, and providing information to the community about the proposed cameras. We feel that at this point the community meetings held to discuss the cameras should involve community members in support of, as well as those opposed to the cameras, without our attendance to ensure free dialogue. If any questions that have not already been answered come up, please forward them to Officer Surwilo and we will attempt to answer them as quickly as possible.